*What causes aging? The aging of human skin is affected by numerous factors. As a result of internal and external factors, the skin changes constantly from infancy to adulthood. Structural and functional changes occur within the dermis layer. The dermis layer is the supporting layer and the epidermis is the outer visible layer of skin. The skin’s metabolism and natural functions start declining from the age of 25. Aging means that the cells of our skin are unable to replenish themselves properly and over time the skin’s natural protective external barrier to defend against bacteria is weakened. This results in dry complexion, wrinkles, sensitive skin and loss of skin elasticity. After the age of 45, the skin will start to become thinner – making it more vulnerable to damage caused by environmental factors. Research studies, many experts and dermatologists indicate that red light emitted by collagen lamps stimulates and activates the production of collagen and elastin. These are the main proteins that contribute to our skin’s elasticity, texture, and tone. *What can I expect from the use of collagen fluorescent lamps? Based on research, collagen lamps may improve skin tone and texture, control pigmentation spots, help reduce pore size, encourage vibrant looking skin, and reduce the appearance of wrinkles. The red light also stimulates blood circulation and repairs elastin fibers within the tissue to help keep the skin firm. *Is red light safe? Using red light emitted from collagen lamps is one of the few methodologies that gently and harmlessly reduces the signs of aging. Red lamps are free from ultraviolet light and are considered pain free – no healing or downtime is involved. Invasive anti-aging procedures such as microdermabrasion, dermal fillers and other injections, chemical peels or laser resurfacing can have serious side effects. When using collagen fluorescent lamps, a physician should be consulted if light sensitive medication is prescribed or if the consumer suffers from increased sensitivity to light. Some people may also experience brief warmth (“glow”) following use of collagen lamps. Finally, as with all other technologies, collagen red light cannot be used indiscriminately with other products that may themselves cause side effects. *What drugs may cause light sensitivity? Drugs that may cause a light sensitive reaction include, for example, certain antibiotics or anti-malarial drugs, Tetracycline, Digoxin (used for heart irregularities/heart failures) and photosensitizing drugs that cause cataracts (e.g., tranquilizers, sulfa drugs, oral anti-diabetic drugs, antidepressants and steroids). Please consult with your doctor before using collagen light therapy if you take any of these medications or any other medications which may cause light sensitive reactions. *How does red light emitted from collagen fluorescent lamps penetrate the skin? Studies have shown that visible red light penetrates to the bottom of the dermis down to the fatty layer and it also has beneficial anti-inflammatory properties. 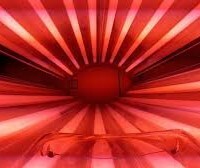 While red light stimulates the skin’s ability to produce collagen and elastin, it also increases oxygen and nutrients. Red light in the visible light spectra between 600nm and 700nm also stimulates the skin cell’s vitality and permeability. Laboratory studies have shown that skin cells grow up to 150 to 200% faster and deliver powerful therapeutic benefits to living tissue when exposed to certain light wavelengths. *Will I get tanned if I go in a full body collagen device? No, collagen red lamps do not radiate UVA or UVB rays. There is no tanning effect. *How do I have to prepare my skin before use? Prior to using, the skin in your facial and décolleté area (upper chest) should be thoroughly washed and cleansed. We recommend using a mild cleansing soap as it improves the transmission of red light into the skin. In this way it will not be blocked by any particles which can reflect the light. *How does using red collagen light differ from laser treatments? Red light is non-invasive, natural, pain free and does not cut, burn, or break the skin as do laser treatments. There is also no downtime. Ablative lasers use heat and concentrated light to vaporize or remove tissue. Collagen lamps produce no vaporization or burning of tissue and therefore no inflammation or burning. Research has shown that using red collagen lamps is one of the few available non-invasive “tools” that works naturally to alleviate the appearance of aging skin, such as wrinkles and mottled skin tone. *Does red light treat cellulite? No, there are no studies that suggest collagen fluorescent lamps treat cellulite. *Is IPL (Intensed Pulsed Light) or Laser used in the same way as collagen lamps? No. All of these technologies use “light” as the energy source, but the applications are highly different. IPL and Laser radiation therapies are considered as invasive treatments. Patients may suffer from swelling, bruising or long-term skin damage.